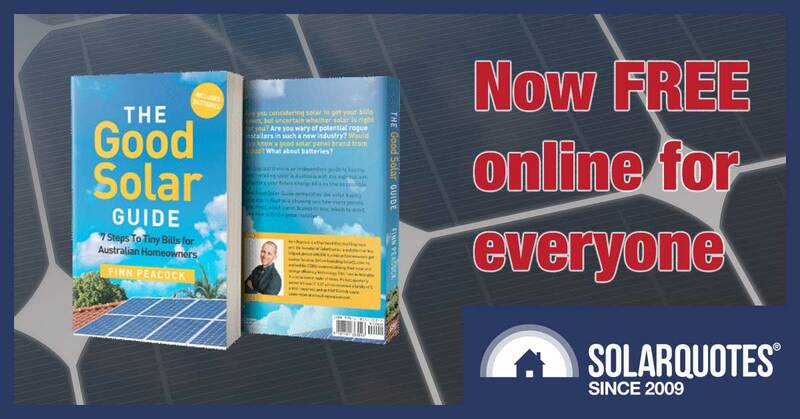 In June I published everything I know about buying solar in Australia as a full-on, professionally edited and published book. We had a big, posh book launch – opened by the SA Environment Minister and I’m happy to report that the book has been selling steadily ever since. Many people consume information better when it is a real book. It has helped me get the message into the mainstream media – ‘Book Author’ seems to go down better with the TV and radio people than ‘Business Owner’. I’ve always wanted to write a book and thank my Mum in the acknowledgments. It forced me to sit down and think really hard about what people need to know and how to structure it. Plus the editor’s deadline meant that I actually got it written. It forced me to engage professional editors and illustrators – something that isn’t feasible with every blog post. That makes the information easier to consume – so more people should read and benefit from it. But I always intended for the information to be set free online. Information wants to be free – and nothing – not even $25 should get in the way of good information that will help reduce your electricity bills and clean up Australia’s energy mix. So as of last week, all the information in The Good Solar Guide is available online – as web pages – for free. Of course, we will still be selling the book for those of you who don’t fancy staring at a screen for hours or need something you can put under the Christmas tree perhaps…? Why is it available for free? I don’t want anyone to be stuck with high electricity bills because of a lack of information. So my erstwhile colleague Michael has spent the last couple of months painstakingly transplanting all the words and pictures online in a way that should be really easy for people to read and navigate. We’ll get more traffic. Good solar installers will get more business through our 3 quotes service. And Aussies will have access to all the information they need to get tiny bills. Win-win-win. Now the content is online I can also update the online book easily as things change; which they do very quickly in this industry. I plan to republish the book as a new edition at least every year with all the changes made online transplanted back to the printed page. 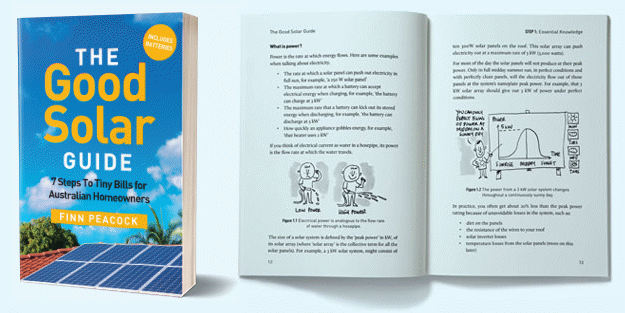 Writing the book forced me to break the solar buying process into 7 steps. If these steps are not followed, you risk getting a solar power system that does not do the job. That is, you will still have substantial electricity bills despite solar panels being on your roof. I can’t stand the thought of anyone in 2018 who owns a roof in Australia having a power bill worth worrying about – it is just not necessary with current technology. To drive this message home I’ve written a separate case study of someone who installed a system before the GSG was published. They did all the right things in terms of buying a good quality system, well installed by a good installer. But they didn’t look at the big picture – and look at their consumption when deciding what size system to buy and critically, they neglected to upgrade their hot water service. The result is that their first post-solar bill (over winter) was disappointing. How complicated it was to establish that their system was working and their billing was correct – because they did not have the monitoring I recommend – Solar Analytics – installed. What they may have done differently if they’d had the benefit of the information in the Good Solar Guide before they purchased the system. What their bills might be if they’d made a few key decisions differently. 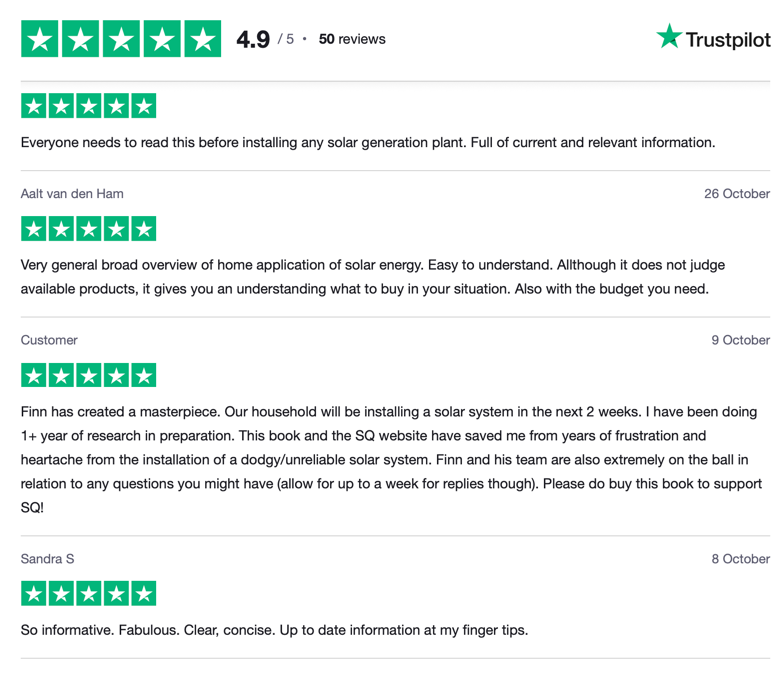 If you do read The Good Solar Guide online, it’s also a great opportunity to let me know immediately if you find a mistake or disagree with any recommendations. Just hit the feedback link at the bottom of each page and fire away. I’ll read every email, and can update the online version almost immediately, ensuring it becomes the best guide possible for Aussie homeowners wanting to join the energy revolution. Which link is broken for you Andrew? The link to the read online bit. I keep ending up at the “buy” section. The 3rd yellow button on the ‘buy’ page takes you to the table of contents with links to the online version. But I can see how that is confusing now! One thing that doesn’t seem to be mentioned is the importance of ensuring that the underlying roof support system (roof trusses etc) can safely handle the additional load placed upon it by the solar panels. Warranties associated with solar system installations generally specifically EXCLUDE any liability for damage that might arise if your roof collapses (for whatever reason) at some future point in time. Solar panels are quite heavy – say 18Kg to 20kg each. Put 25 or more on your roof and you’ve just added half a metric ton of weight, concentrated over possibly a relatively modest % of your total roof area. Throw in a roof-top solar hot water tank and its heating panels as well and you’ve maybe added a further 1/3rd or so of a metric ton on top of that. If your roof has clay tiles, then those too collectively weigh considerably more than corrugated iron or colour bond sheeting does. I’m not suggesting anyone should panic and race out to buy 100 or so helium filled balloons attached by wire to your house roof to take some of the load off. Building standards do have considerable safety margins to ensure your roof doesn’t get torn off by cyclonic winds. Anyway, ‘roof structural support’ is a relevant issue, and its one of the reasons whenever I’ve had a solar hot water system of any type I’ve always ensured that the hot water storage tank is placed down on the ground. Makes it much easier to maintain and replace when needed too. It’s a good book = sorts out the ‘sheep from the goats’ in the industry. Read it before embarking on a solar installation!